It's an Amphicar! It's an Amphicar! 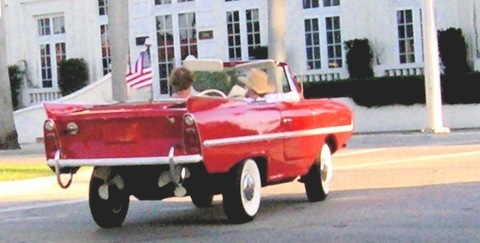 Special Agent Oddwick recently enjoyed an Amphicar sighting in Florida, although he didn't fully realize it at the time. Instead, he reported seeing a "boat/car thingy" and noted that he didn't believe the propellers were functional. The Amphicar has a top speed of 7mph on water and 70mph on land. Hence, it was dubbed the "Model 770". The Amphicar is moved in the water by its twin nylon propellers. A special two-part land-and-water transmission built by Hermes (makers of the Porsche transmission) allows the wheels and propellers to be operated either independently or simultaneously. The "land transmission" is a 4-speed-plus-reverse unit similar to those found in the old Volkswagen Beetles. The "water transmission" is a 2-speed offering unique to the Amphicar featuring single forward and reverse gears. In the water, the front wheels act as rudders. When new the Amphicar sold for between $2,800 and $3,300, depending on the year. Amphicars have crossed the English Channel in 20' seas and traversed the Yukon. In Berlin, the police used a few as search and rescue vehicles. Buyers could order the vehicle with a built-in shower that ran off the bilge pump, and it seems the manufacturer also offered an amphibious camper trailer. Apparently, it's even possible to water ski behind one. Slowly. Having an Amphicar fantasy? No need to be ashamed. We have them too. But dreams seldom come cheap. A fully restored Amphicar can today fetch upwards of $30,000. 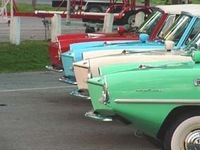 Don't miss the upcoming International Amphicar Festival this July in Celina, OH -- just a piece down the road from where my ancestors first infested these United States. NPR did a radio segment on the festival in 2005.
can you tell me some one have one in puerto rico i will love to see one thank you.